According to Chinese astrology, 2016 is the Year of the Fire Monkey. Astrologers forecast that 2016 is the perfect time to shake things up and create positive change. With the Monkey’s enthusiastic vibe, anything is possible—even the most ambitious plans can succeed. The Monkey, which denotes mental agility, has the characteristics of being clever, energetic, versatile, innovative and sociable. Indeed, the Year of the Fire Monkey presents new and exciting opportunities for those who want to take on new plans this 2016, such as improving one’s professional career or becoming a better version of yourself. Each new year always presents us a chance to review our life and career events in the past year and examine which plans worked and which did not. 1. Identify opportunities for improvement. It may be daunting or even scary to face our fears and failures, but what can be more admirable than acknowledging them? It takes great humility to accept these but take some time to understand that it is necessary for your own character development. As the saying goes, “we learn from our mistakes.” Remember, you cannot move on to a happier year if there is an excess baggage dragging you down. 2. Declutter your life. Is your bedroom messy? Does your work station look like a disaster zone? Then maybe it’s time for you to clean your room and dispose of the things that you don’t need. Take note that a cluttered workplace would lead to erratic job output as well. Similarly, as your home is the place of relaxation, make sure that your bedroom promotes rest, recovery and calmness, so that your body gets rejuvenated after a busy day at work. 3. Innovate. The Monkey is clever and competitive. 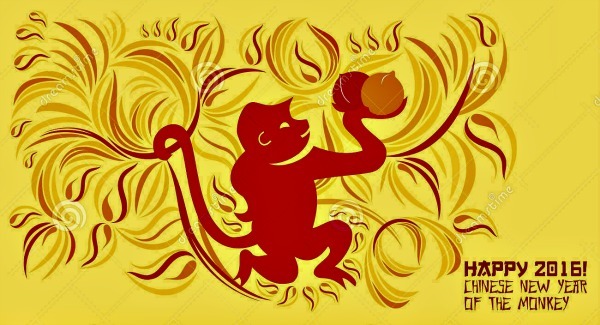 Add to the equation this year’s Fire element, which denotes energy and passion, you will be able to conquer new horizons if you choose to take advantage of the values that are symbolized by the Fire Monkey. Do you have new ideas that are hiding in you somewhere? Now is the time to fight for them and share it with your colleagues. 4. Energize yourself. The Fire Monkey is a very lively and witty creature. These characteristics allow the Monkey to be the life of the party—the one that adds joy and optimism both at home and at work. Make sure you take extra steps in being involved in the company’s many activities, be it official events or simple charity programs. Always be active during team meetings, be attentive to your colleagues and go beyond the extra mile in doing your tasks. 5. Be optimistic. None of your efforts will be useful if you always have negative vibes within yourself, your home and your office. Make sure you get rid of these distractions by exercising control over your emotions and by observing harmonious relationship with one another. 6. Create new connections. The Monkey is also known to be sociable. In business and in the professional world, you will need to always constantly add more people to your contacts, to your networks. Take extra steps in attending more seminars, conventions and even parties. You will be surprised that the world is small, who knows, your next big break will be made through those connections. 7. Just do it! Lastly, the Monkey’s intelligent and ambitious characteristics will allow you to constantly fuel your drive in achieving your dream. Have you always stayed in the same spot for the last five years? Challenge yourself. Take that leap and move forward. Just do it. “At Teleperformance, we focus on giving our employees a great work experience by creating a conducive environment for them to grow both as an individual and a professional. Teleperformance trains its people to be at their best in providing excellent customer experience at every touch point, while providing them avenues where they can play, interact and have fun. “Now in its 20th year, Teleperformance continues to be a stable job provider for more than 41,000 Filipinos. If one wishes to join this growth, job seekers can turn to Teleperformance for a career that is as exciting, energetic and passionate as the Fire Monkey,” she added.